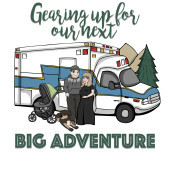 We are trying to gear up for this new adventure. We are so grateful to have you in our lives and can’t wait for you to meet the babe. Thank you for thinking of him and helping us we appreciate you. All our love.